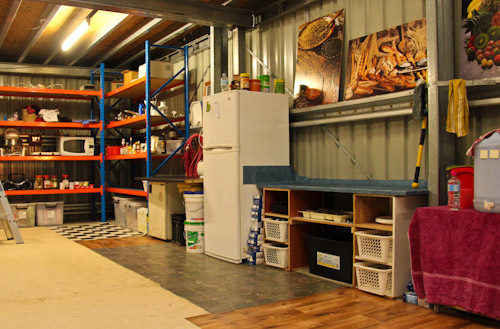 After almost two weeks back in our shed home, we’ve brought it to a state where we can live comfortably in it as well as store our things while we’re away. 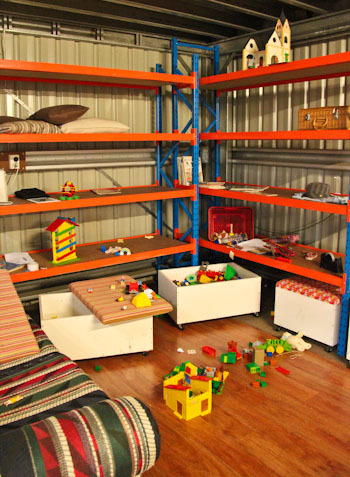 Although we love our nomadic lifestyle, it’s wonderful to have a base camp — somewhere familiar where the girls can be reunited with treasured toys and David and I can just chill out. This is what our shed looks like now as our base camp. 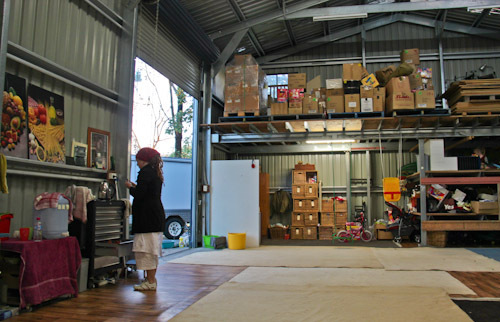 It’s a huge warehouse, and when out of the country, we park our truck and trailer inside. So we’ve laid down a hodge-podge of floorcoverings that cover the concrete but can easily be rolled up to bring the vehicles inside. 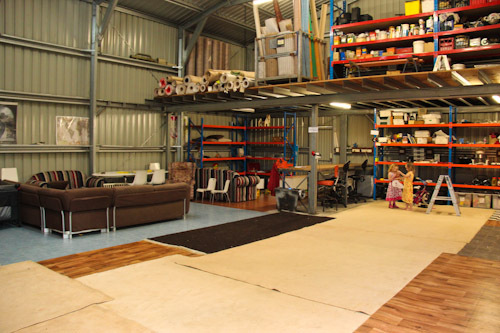 We have taken all David’s tools up to the large mezzanine floor and have begun bringing down some of our household possessions to make the shed more “home-like”. We’ve been spending a lot of time re-thinking bed-spaces and are experimenting by sleeping ourselves and the girls in multifunctional areas. This is the ultimate in open-plan living — we have plenty of room to ride bikes inside! The far corner of the shed is our toy corner, and where David and I sleep. We open up the sofa-bed each night (after packing away any toys still laying about). 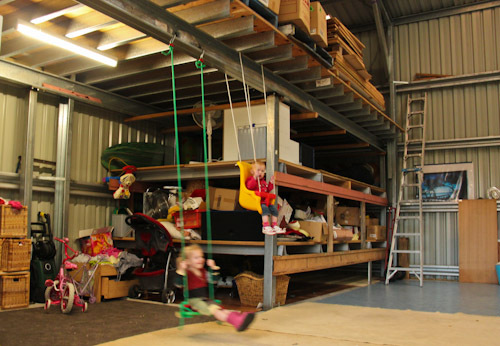 We use part of the space underneath the small mezzanine floor as storage, another level as a sleeping and playing space for the girls, and the top floor as storage. We call this the "Clothes Corner". It holds our garments when we're not travelling. When we're ready to hit the road, we'll simply pack up the relevant baskets into the back of the truck and drive away. We keep our camping toilet and the potty behind the privacy screen in the Clothes Corner. The house has a bathroom with an exterior door, so we have access to that, but sometimes it’s nice to use an “ensuite” — particularly in the middle of the night! The storage boxes up the top of the small mezzanine represent the usual detritus of life that is really unnecessary but I can't bear to get rid of — yet. Another corner is our electric-kitchen set-up. This complements the camp-kitchen we keep in the trailer. We’re pleased to have set up our base camp. 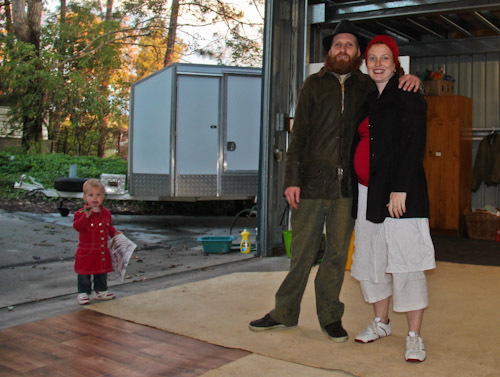 Now we can focus on fitting out the truck again (with a new perspective — travelling with less! ), and we’d also like to have some friends over. So if you’re in the area, do pop in! Here we are! (Aisha took some of the photos in this article, including this one.) We have our trailer parked out the side of the shed — and soon we'll be packing up into it to head off on more adventures! Gosh, I was just thinking I’d love to meet you guys! We’re flying to the Goldy this monday for my bro in laws wedding, maybe we’ll try and visit! I’ve been wanting to see a photo of that belly! I’m just in awe of your lifestyle! So free! I’ve definately gotten bitten by the travel bug since coming to New Zealand. You guys rock! Oh my goodness, that is exactly what we want for our family one day!! I am not kidding you. And yes we will be back in OZ soon. Its good to try things to see where they lead you, don’t you think. Much love to you all! Love your base camp set up!!! Looking really good – you and David are so clever! We’d love to come for a visit .. How’s Monday 19th – its school holidays and I’ll have both kids with me? Wow – I love your Base Camp! That shed is amazing – you guys have the best of both worlds…travelling when you want, and a home (shed) to come home to! I am so looking forward to meeting you guys one day soon. You are glowing and look amazing! Are you going to find out what you are having? What about where you will be birthing? 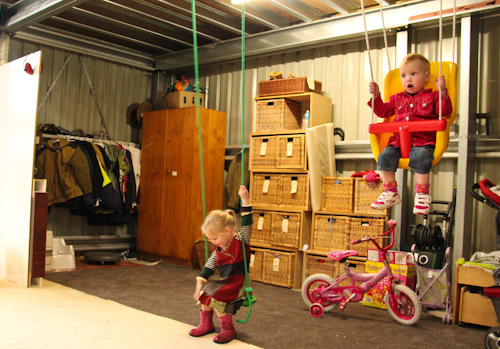 I reckon that shed is big enough for a birthing pool…and it will soon be warm enough!